How to reset / change EPF UAN Login Password, How to Forgot UAN Password or UAN Login Employee Password without changing the mobile number and Reset your Universal Account Number Password if you Forgot / Lost…. Employment Provident Fund Organisation (EPFO) has provided the facility for Epf account holders, who have lost/ forgotten the UAN (Universal Account Number) number. So, if you want to recover or reset your UAN password or any queries like, epfo forgot password, Mobile number change, UAN Password not working, Reset UAN Login Password, etc. we have provided the information on how to reset or change the UAN number with your registered mobile number. 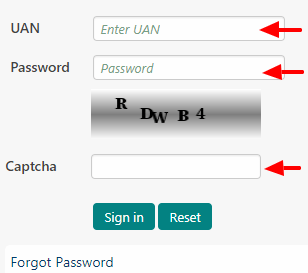 Follow the given steps and change/ reset / lost your UAN Login Password on Online. Before going to change the UAN number keep your registered mobile number. Because, the OTP (One Time Password) has received at the time of changing the UAN password. Lot of Employees are confused to reset the UAN Login Password by using PF Number or Universal Account Number. Here we will provide the instructions how to forgot uan password or how to reset UAN password. Then you can see the other new window, Enter your Universal Account Number (UAN) and Registered mobile number, then click on ‘Yes’ button. Then you can get the OTP in your registered mobile number and enter OTP number in the provided placed. After that click on verify button. Once your OTP number has verified, you can create a new password on that page. So, create a new password and re-type the same password in the confirm password section. Once you reset the password successfully, you can login with your UAN number and password and verify your details. UAN means Universal Account Number. The UAN is a 12 digit number allotted to an employee who is contributing to EPF. An employee should have only one UAN (Universal Account Number). Your Provident Funds or Member Ids would be linked to your UAN. It will maintain all your Member Ids. when you change your job and the new employer, if contributing to EPF, gives you a new Member ID. The majoe contributing of it is no two members will have the same UAN number. You will get SMS on your registered mobile number mentioning your username and password. After getting the login details to your registered mobile number then, login via new password to UAN Member portal and change your password.